Our chapbook giveaway is still on. You have 25 days left to enter (again). Details here. Remember, linking to any of our chapbook-related blog posts from your blog gets you two entries. 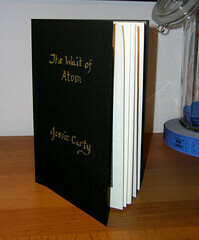 Jessie Carty’s chapbook, The Wait of Atom, will be released on 10 November 2009. Join us on our ning the evening of the 9th for our Live-Chat Launch to celebrate. Pre-orders for the print editions of both our chapbooks are going so well that we’ve had to change our expected ship dates on new orders. If you order today, Jessie’s Atom will ship on 17 November 2009 and Mel’s Razzed will ship on 26 November 2009. The pre-order discount and signature option will expire on 1 December 2009, so get your order in soon! We hope you’re enjoying unFold and PicFic this week. As always, we’d love your feedback. i’m tired just reading this!